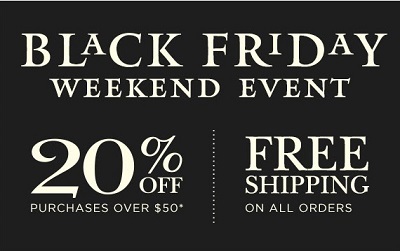 Black Friday Weekend Sale 2015 at Crabtree & Evelyn stores in the U.S. and online is still on. Take 20% off your purchase of $50 or more. Plus, take an advantage of free shipping on all online orders. Source of the information is Crabtree & Evelyn. Offer is valid through 11/29/2015. More details available at stores or online.